It’s Easter now. I’ve tried to make it a policy on this website to take a step back when great days or momentous events eclipse the simple matters of riding trains, setting fares, and checking schedules. The train stories, for those inquiring, are available in the archives. Some days it’s more important to think of other things, and there seems to me to be no better day than this to revisit a story of Cornwells Heights I first mentioned on August 30th, 2005, that of the Saint and the Station. I knew little about Saint Katharine Drexel then. I know much more now, but not nearly so much as I will know in another month or another year or ten, for I very much want to continue to learn of the marvelous skein of connections between America’s newest Saint and the trains that stop at the foot of her hill, called Cornwells Heights. To bring the curious reader quickly up to speed, a genuine Roman Catholic Saint lies in her shrine about a hundred yards up the hill from the main, large parking lot at the Cornwells Heights train station. The land of the station was once hers. On October 1st, 2000, when Pope John Paul II canonized Saint Katharine Drexel, the media generally reported her to be the “second American-born saint” after Saint Elizabeth Seton whose shrine is at Emmitsburg, Maryland. But I’ve done a little research, and through no fault of her own, it appears Saint Elizabeth was born a subject of the British crown in 1774; was probably trying to stand upright at the time of the battles of Lexington and Concord; and was most likely toddling quite nicely when the Declaration of Independence was signed at Philadelphia on July 4th, 1776. Katharine Drexel of Cornwells Heights, born in 1858 in Philadelphia, is, indeed, the only saint ever born a citizen of the United States of America. We’re on her land, and therein lies an Easter story. So What Is the Story of Saint Katharine? In a nutshell, she was a fabulously wealthy 19th century heiress whose religious convictions led her to take a vow of poverty, became a nun, establish her own religious order, and use her wealth and her order to care for and educate Blacks and American Indians from the late 1800’s even to this day. Long before the American Civil Rights Movement of the 1950’s and 1960’s began, there was Mother Katharine Drexel of Cornwells Heights founding roughly 100 schools and missions for Blacks and Indians throughout the United States. And the crown jewel of it all was Xavier University in New Orleans, begun in 1915, the only Black Catholic University in America. The daughter of a tremendously wealthy banker, she was raised in a home where spiritual devotion was the core of her and her family’s life. She was taught from an early age that the gift of wealth her family had received was to be used first and foremost for good works and deeds. When her mother died young, and her father followed two years after, she and her sisters were left with $14 million in a trust fund. In 1885, that was really, really big money. All three sisters used the money for good works, and all three built schools in various places, their top priorities being orphans, Blacks, and Indians. But Katharine needed more. For a few years, she traveled and gave money to support and establish Catholic Indian missions throughout the U.S., but then she made a fateful trip to Rome. In an audience with Pope Leo XIII, she asked him for more priests to be sent to the American Indian missions. The answer then that rocked her soul was, “Why not, my child, yourself become a missionary?” Long having thought of becoming a nun, she first thought to join a “contemplative order” devoted entirely to worship and prayer while leaving her fortune to established Indian welfare agencies. But her closest spiritual advisor, the Bishop of Omaha (formerly stationed at Holmesburg, PA; hence the connection), first advised and then insisted that the most good would come not from assorted half-hearted agencies sharing the wealth, but from a new religious order which she must found and direct for the good of America’s Blacks and Indians. Like all good heroes and heroines, she at first shrank from the idea in near terror. As if it were not enough to vow poverty, give away her fortune, and submit her whole life to a new order and a Mother Superior, suddenly she was expected to become a Mother Superior as well, and she felt herself ever so inadequate to the job. Not alone in her decision, but with the encouragement of her closest advisors (and over the objections of many others close to her), she accepted it as “the will of God” that she must face the task and do it, and trusted that He would show her the way. She was nearly 31 when she took her vows of poverty, chastity, and obedience; and barely 32 – and desperately concerned about one of her mission settlements surviving the aftermath of the Wounded Knee massacre just 11 days before – when she officially became Sister Katharine of the Sisters of the Blessed Sacrament, the first member of her own new order. Who and Where Are the Sisters of the Blessed Sacrament Today? Well, some are spread throughout our country at missions and schools. But many of them, especially the oldest and the infirm, are just a stone’s throw up the hill from our big parking lot at Cornwells Heights. Some that are there now even knew and worshiped with Saint Katharine before her death at 96 in 1955 (just about the same time some poor lab rabbit died for me, if you know what I mean!). The convent on the hill, the Motherhouse of the Sisters of the Blessed Sacrament, is now in large part a nursing home for those who worked without fanfare, quietly, patiently through the 20th century for the education, civil rights, and faith that Mother Katharine gave her dreams and her life to. I doubt that many Americans realize how much of what we hold dear and proud about our country and its most cherished ideals today has come down to us from Cornwells Heights’ lady on the hill. If you’ve ever wondered what buildings looking a lot like part of an old Spanish mission are doing in Bensalem, Pennsylvania, not far from our cars and trains, they’re there to be muy simpatico with the Spanish Indian missions of the old American West. And Saint Katharine rests below the cross on the little dome to the left. Is There a Train Story Somewhere in All of This? You bet there is! 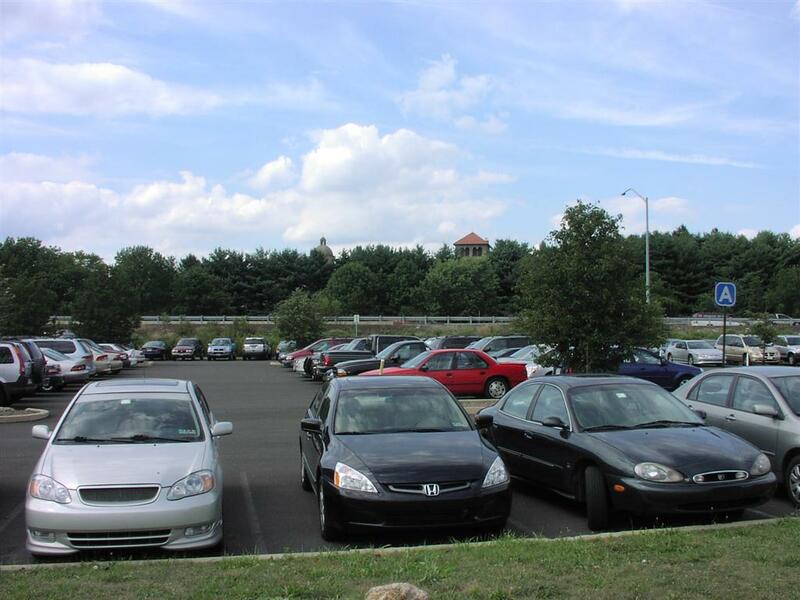 It’s no accident that Mother Katharine’s convent, her spiritual home, her Motherhouse, is on the hill above the station, and that our parking lot was once her back yard. She put the convent there; she built it there to be with the station. As best I understand the history of Cornwells Heights, the railroad came through as a right of way with trains on it even before Katharine Drexel was born. There was a stop there called simply “Cornwells” after an old man named Thomas Cornwell who died in 1839 (and was only “rediscovered” about two years ago in the cemetery at the top of Station Avenue) and presumably owned or worked on land around the station even before the railroad arrived. The community that developed on the hill above the station and near the convent then became known as “Cornwells Heights,” and that name in turn migrated back to the station. There is a little road to nowhere on the convent grounds today, a road that starts out well enough branching off from the Bristol Pike (Route 13) into the convent grounds, but after a certain point it dissolves into the customary urban soup of sand, leaves, and crumbling asphalt that old, untraveled paths become after fifty years of neglect. The nuns’ road to the station was cut off in the 1950’s by I-95, but once it ran straight down B Section of PennDOT Lot 1. And the Sisters of the Blessed Sacrament went down to the trains and out to America, and sometimes they came back for missions more in health, and sometimes they came back to die. The four stops of the SEPTA R7 Line from Holmesburg Junction up to Eddington were the spiritual corridor of Saint Katharine Drexel’s life. At Torresdale she spent some of the happiest days of her youth at the summer home her family called St. Michel (St. Michael) which also served as her order’s first Motherhouse and has now become a quaint appendage attached to the back of the Frankford-Torresdale Hospital complex, visible only from the circuitous common exit road that drains the hospital’s several parking lots. It was from Torresdale that she and her family took their private rail car on her first tour of the American West. At Holmesburg she met Father James O’Connor, the man who guided her spiritual life from youth to the beginning of her order. It was he who advised her for many years to keep herself “in the world, but not of it” until she battered him into submission, at which point he not only caved in on the issue of her becoming a nun, but commanded her to found her own order. At Cornwells Heights she found the acreage she needed for her convent and the train station she needed to send herself and her nuns out on missions and into the world. And at Eddington her sister Elizabeth established an industrial school for orphans grown too old for the orphanages. Elizabeth died in childbirth before Saint Katharine’s Motherhouse was built, and so the Motherhouse came to be named St. Elizabeth’s in memory of the sister lost. I received a very poignant note from an old railroad man shortly after I published my first few thoughts on Saint Katharine last August. He wrote me that the even older railroad men he knew long ago passed down the story that Mother Katharine had deeded some of her land to the railroad for the Cornwells Heights station with the stipulation that the station be kept open for all time, that the children of Philadelphia should always be able to come to her convent. Indeed, the Sisters once ran a school for them there. I’m a bit afraid to look up the actual deed, though, as urban legends often turn to mist, but in a way, it’s even more important that the old men of the railroad believed that Mother Drexel and the station were inseparable. Perhaps, in a way, they are. There’s Another Train Story, and I Don’t Know Where It Ends. Last August and September, I at first thought I was inside a story of my own making about saving an Amtrak stop at a small station in Pennsylvania. But no sooner had I started the project and this website than a tropical storm named Katrina became a hurricane, and perspectives changed, and for a few days I couldn’t write about trains, so I wrote of a storm and of prayers from a spot farther down in me and aching. I recalled the bittersweet song of America’s disappearing trains, The City of New Orleans. I noticed, almost in passing, a saint on a hill. And even later I recalled with irony the famous, staple song of the City of New Orleans, When the Saints Go Marching In. As I wrote in my sincere but blatant attempt to interest President Bush in the “faith-based” spiritual side of the Cornwells Heights saga, “For me, the storm and the saint and the station and the songs and the trains and the city all became one very strange blur of meanings and thoughts last September.” And so it was, and so it is, that like 9/11, which I also witnessed and have tried to understand, there was a brew of thoughts and passions in my September that seemed to fit together in an almost unpredictably, incomprehensibly perfect way. But there was another story on the hill in those September days, and I’m still learning what it was and is. Xavier University in New Orleans, the crown jewel of Saint Katharine Drexel’s spiritual dreams, sat square in the path of the hurricane, behind levees that might not hold. Many students evacuated in time, and some of the Sisters of the Blessed Sacrament returned from there to the Motherhouse at Cornwells Heights to bide the storm. But a group of about 250 students, faculty, staff, and University neighbors ended up caught with no way out, and they chose to ride out the tempest in Xavier’s hurricane-hardened buildings. At least one Sister of the Blessed Sacrament was among them. An old man died. The rest survived to be rescued days later. And when Sister Grace Mary Flickinger finally came home from New Orleans, she came home to Cornwells Heights. I’m happy to say, though, that she’s back in New Orleans now, and the University goes on. I can barely imagine the kilo-nun wattage Cornwells Heights must have been emitting in prayer from states of grace for a few key days in September. On September 15th, the station was spared by Amtrak, and though I thought at the time that I had willed it to be, maybe, in a very strange case of cup-o’-grace-runneth-over, I was just carried along by footprints in the sand dusting the leaves on that little asphalt road, going back to the hill from nowhere. In New Orleans past and New Orleans present and New Orleans future, there will always be trombones, snares, and trumpets for When the Saints Go Marching In. But in fact there really was a saint, a true-blue American saint, once upon a time in New Orleans, and she came and went and came and went by train long, long ago. I doubt that she “marched,” but perhaps next time she will. And there was once long ago a train, run by the Illinois Central, called The City of New Orleans, and it actually did die and disappear for a short time just before Amtrak was formed. Amtrak resurrected the old train with new colors and pretty much the same route it had always traveled from Chicago to the sea. It’s my best current understanding that the song The City of New Orleans was written in the disappearance time to mourn the train’s passing. But yet it, too, survived. No matter what your faith, may this Easter bring you a “rebirth” of spirit and of hope. Thank you, Kim. Thank you, George.